This particular new bar of chocolate in the Marks And Spencer's Spirit of Summer range, was purchased via a recommendation of Twitter. Actually “recommendation” is pushing it a little, it was more having the weirdness of the bar pointed out. Still it triggered me picking it up last weekend, so that I could give it the taste test. Now the chocolate is notable for a couple of reasons l, one the filling is indeed weird. 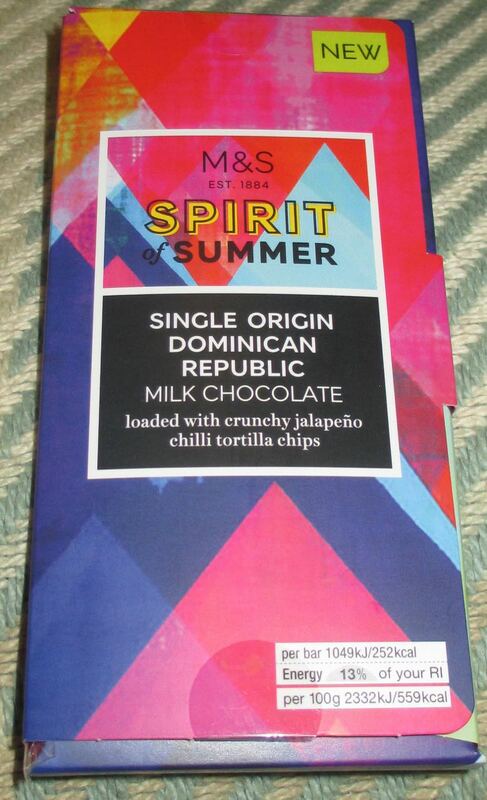 Milk chocolate with bits of crunchy jalapeño chilli tortilla chips, but I’m all for innovation. Secondly they used a very high quality single origin chocolate to mix with such a strange ingredient; Single Origin Dominican Republic cocoa. An interesting choice, the idea of a pure cocoa bean chocolate mixed with spicy chilli chips. One could say that you should always start with the best ingredients, but then again its crunchy spicy tortilla they put in it! The bar itself is very smartly packaged, wrapped in card with an explanation of chilli and chocolate going back centuries as a flavour combination. The bar itself is quite thin and the pieces are smallish but neat. I gave it the taste test, and found the bar to be a bit odd. The chocolate is really good. 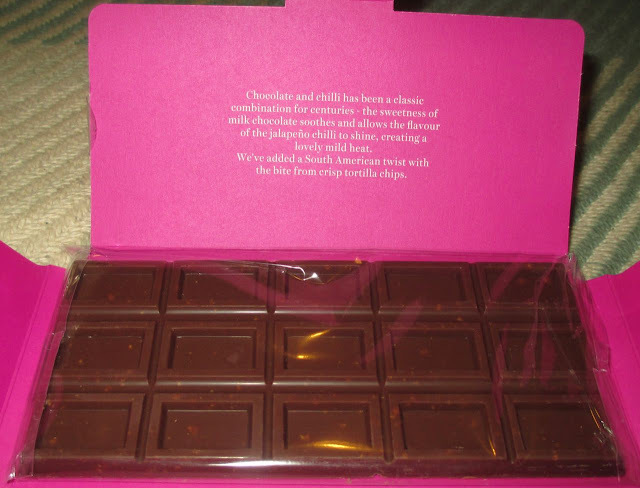 It's a fairly soft milk chocolate and the cocoa flavour is distinctive and smooth. There is plenty of sweetness and overall this tastes like a comfort bar, despite the pieces being to small for this really. The main problem is the chilli tortilla chips, they add crunch but in a sort of bitty way. It takes the edge off the smoothness of the chocolate. As for flavour, it barely adds any, its like they tried to gauge it so carefully not to interfere with the posh chocolate they under estimated and it was barely noticeable. There wasn’t enough for it to be a fun bar, and the crunch and vague hint of chilli tortilla crisps left me wishing I’d bought a plainer bar. This range is interesting for sure... the other day I bought the coconut milk chocolate bar (made with coconut milk - nice but very soft and melty! ), and the dark chocolate bar with sugar cane. The latter was a bit weird, I am not used to my dark chocolate tasting so sweet, but then it developed into a banana-like taste and I was happy. Also saw a Dulce de Leche bar which I nearly bought until I noticed there was popcorn in it. Whyyy? !